Muppet Babies was my first introduction to the Muppets and I especially loved Miss Piggy. I even had a Miss Piggy doll! 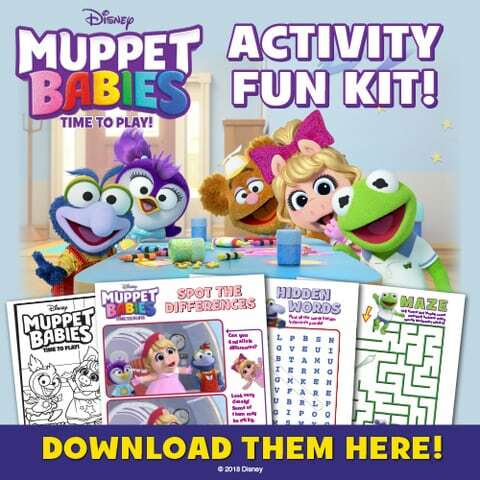 Now you can share Muppet Babies with your kids with MUPPET BABIES: TIME TO PLAY! on Disney DVD today, August 14th! 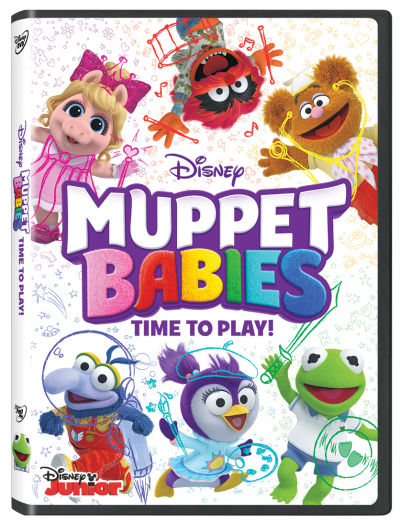 Along with four episodes from the series, this collection includes two bonus episodes, ten “Muppet Babies: Show & Tell” shorts and six music videos. 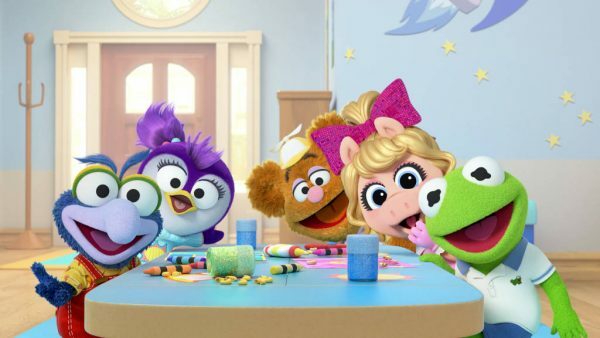 Almost 30 years after the Muppet Babies first won the hearts of kids and families around the world, Disney Junior’s reimagined “Muppet Babies” chronicles the hilarious playroom antics of a young Kermit the Frog, Piggy, Fozzie Bear, Gonzo and Animal – plus a brand-new Muppet Baby, Summer Penguin. Under the watchful eye of Miss Nanny, the Muppet Babies use their imaginations to embark on countless adventures that take them to the farthest corners of the universe and demonstrate to young viewers the power and potential of imaginative play. The voice cast includes Matt Danner as Kermit the Frog, Melanie Harrison as Piggy, Dee Bradley Baker as Animal, Ben Diskin as Gonzo, Eric Bauzaas as Fozzie Bear, Jessica DiCicco as Summer Penguin, and Jenny Slate as Miss Nancy. Your kiddos can snuggle with their favorite Muppet Babies characters with these fun plush toys, too! Reader Giveaway: One lucky Jinxy Kids reader will receive a copy of Muppet Babies: Time to Play! 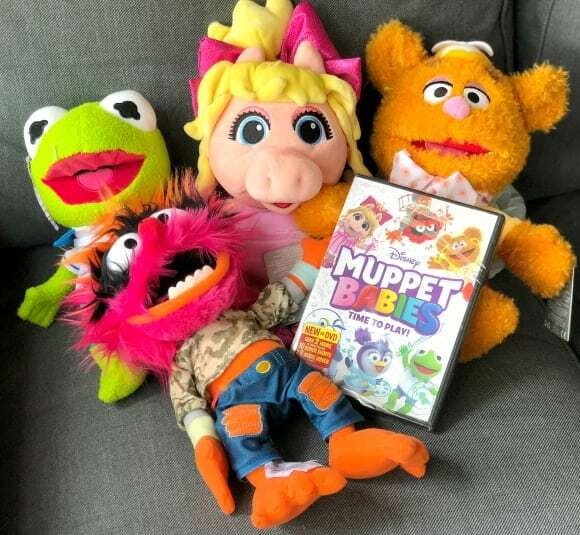 on DVD as well as four Muppet Babies plush toys just like in our photo above. To enter, complete the entry form below by 11:59 pm ET on 9/3/18. Good luck! My favorite Muppet is Gonzo and this will be for my daughter if I win. My favorite has always been Animal, but my daughter who is 3 she loves Fozzie. Love Animal for my grandson. Miss Piggy will always be my favorite. My favorite muppet is Miss Piggy! But my two boys will be sharing this prize pack if we win and my 4 year old loves Animal and my 2 year old loves Kermit! I am so excited to share Muppet Babies with them. This was one of my favorite shows when I was younger! I live Fozzy Bear, even though as an adult I don’t think he’s funny, as a kid I did. Wacka wacka wacka! My twin 2 year olds will be getting it if we win. Carry on the tradition. I would gift this to my nephew Duncan. Thanks for the chance to win. My favorite is Gonzo. My niece will claim these if I win. My favorite muppet is Gonzo and I would love to win this so I can share it with my nephew. Thanks for hosting the giveaway. The swedish chef is my fave, and my nephew and niece would get this. My favorite is Fozzie Bear. Miss Piggy is my favorite and I will be sharing this prize pack with my daughter if we are blessed to win! I like Kermit. I would give this to my daughter. Walter is my favorite Muppet. I will claim these if I win, since I am a BIG Muppet fan. 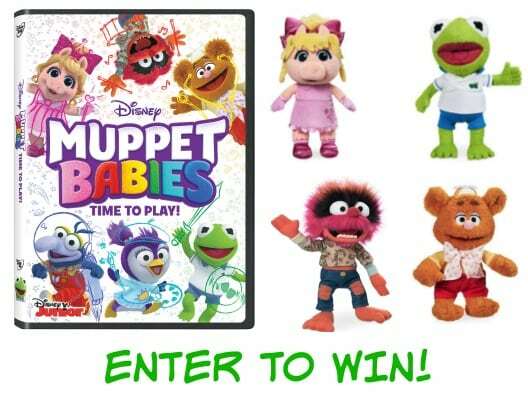 “Let us know your favorite Muppet and/or who will be enjoying this prize pack if you win.” Kermit! I love me some Kermie! Missy Piggy was always my favorite and I would enjoy this with my daughter, Amberly. I like miss piggy and this would be for my daughter . Favorite muppet is Ms. Piggy. I think I would give this to a friend who has young children. My favorite muppet is Fozzie Bear. He is so cute. My granddaughter would be thrilled with this pack. I always liked Miss Piggy, and would love to share this with my daughter. My son would like this! I love summer and Kermit! Kermit is my favorite muppet. We love animal he’s our fav!! Gonzo has always been my favorite muppet and I know that my grandson would also enjoy watching Gonzo’s slly stunts. Miss Piggy for sure, and it will be for my nephew who’s favorite is Kermit. My 8 month old loves watching muppet babies. Can’t tell who his favorite is, he smiles when it’s on. Our grandson would love this! My favorite is Animal. I love Miss Piggy and my son love Animal. He is obsessed with the show. My favorite muppet is Miss. Piggy. I will be sharing this prize back with my 2 daughters, ages 3 and 5 years old. OMG, I loved Animal SO much! Miss Piggy is my favorite! My kids would enjoy this prize package! I like Kermit the Frog and I would give this to my nephew if I won. Miss Piggy is my favorite muppet. Our Zaidens favorite is Fozzie and our KayLee’s favorite is Miss Piggy. The kiddos really like Fozzy Bear. This would be for our grandkids to share. My favorite Muppet is Miss Piggy! My favorite muppet is Animal! I like Animal. My kids would love this. My favorite Muppet is Miss Piggy. My whole family will be enjoying this! I love Fozzy Bear…..my niece would be enjoying this! My favorite character is Mrs. Piggy. My 3 yr old Alex will be enjoying these if we win! Fozzie is my fave and I would love to win this for my daughter. My favorite Muppet is Fozie Bear and my granddaughter would really enjoy these. My favorite character is Animal. My favorite character is Kermit and my niece would be enjoying this! Kermit is always a favorite and my youngest niece would LOVE this. I would give this to my nieces, and I think they would love Miss Piggy! My favorite Muppet is miss piggy. My daughter would love this. My favorite Muppet character has always been Kermit. It’s not easy being green. Thank you for the fun giveaway. miss piggy is my favorite. i love her so much. 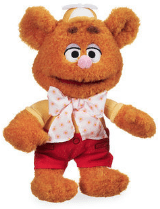 We love the new Muppet Babies – my sons favorite is Fozzie Bear – Wocka Wocka! I love Miss Piggy. I have a coffee mug and pillowcase with her on it! My newest little granddaughter will be enjoying this movie and plush es as her dad did for decades before her. Kermit is my favorite muppet. My niece would love to watch this cartoon and the stuffed animals are adorable! My favorite Muppet is animal and I also like Miss Piggy. Fozzy Bear is my favorite character, I will be sharing this dvd with my son. I love Kermit! This would be for my grandson for Christmas. We love Miss Piggy! Our Samantha would love this. I just love baby Kermie!! Fozzie Bear has always been my favorite! Wakka wakka wakka! My favorite has always been Miss. Piggy and I would share this with my littles. My favorite Muppet is Kermit.